Tuition Assistance is offered to families that apply through the Archdiocese of Washington beginning in October through December for current families and January through February for new families. St. John’s School has a scholarship program for multiple child families. At any time during the school year, the Administration is available for consideration of hardship cases of currently enrolled families. 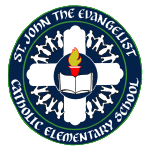 St. John's School is accredited through the AdvancED accreditation process. Click here to find out more. Click here for an expanded view..
School Hours: 8:00 a.m. - 3:00 p.m.
Before Care Hours: 6:30 a.m. - 7:40 a.m.
After Care Hours: 3:00 p.m. - 6:00 p.m.
St. John's School makes protecting our students and your children a priority.